The second season features a brand-new group looking for a lead singer with Tommy Lee from Motley Crue, Jason Newsted from Metallica and Gilby Clarke from Guns N’ Roses. Dave Navarro and Brooke Burke are back as shosts. The BBC series about con artists returns for a third season on a new night. In the first episode, Danny and Mickey argue over who will lead the team, which ends up with them both naked in the middle of London. The first episode reveals who was voted into the house from past Big Brother episodes. Then it goes to the usual schedule of Tuesday, Thursday and Saturdays, which is just way too much time to watch people living in a house not doing anything besides driving each other crazy. Stunt TV from Finland where it has been a huge hit over there for four years. Unscripted comedy starring supporting actor Michael Roof, Jr. (Dukes of Hazzard movie, Black Hawk Down) who is visited in Hollywood by his father and uncle from a small Florida town decide to make an open-ended visit. Monk returns for its fifth season in a new timeslot. This season’s guest stars are Greg Grunberg, Chi McBride and Stanley Tucci as a method actor playing a tv-version of Monk. A young man who is highly observant and his police father (Corbin Bernsen) made him hone his skills when he is a kid so that when he gets older he decides to use these skills to act as a psychic for the poice. His disapproving friend (Dule Hill, West Wing) works as his sidekick. The last sketches Dave Chappelle made before he ran off to South Africa for a bit throwing his $50 million contract out the window. The sketches have been put together for three “lost” episodes Instead of Dave introducing the sketches like the first two seasons, it will be Charlie Murphy and Donnell Rawlings. In an Irish neighborhood in Providence, Rhode Island, one brother is a politician trying to do what’s right and the other brother is a mob gangster that has shown up after a seven-year absence. Documentary series following people with addictions around while their friends and family trying to intervene to get them to quit. Second season summer premiere of Mencia’s part-sketch, part-man-on-the-street interviews about anything pop culture-related, including racial stereotypes and possibly offensive. 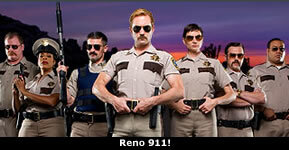 The “reality” series follows the Reno cops who comes back for a fourth season on a new night. Last season, Trudy’s serial killer boyfriend finally proposed to her, but all his appeals had just run out. She tried to have a quick wedding before his execution. Eight short stories from Stephen King shown over four weeks starring William Hurt, William H. Macy, Kim Delaney, Steven Weber, Samantha Mathis, Jeremy Sisto, Ron Livingston, Henrey Thomas, and Tom Berenger. The third season of Heidi Klum’s reality show that is searching for the best fashion designer out of fifteen hopefuls. Season 10 makes this the longest running sci-fi series. Claudia Black (Vala), joins as a regular cast member this season. Richard Dean Anderson is also supposed to stop by more often as a recurring character. The show will also hit its 200th episode this season. Back for its third season, Stargate Atlantis is a successful spin-off from Stargate: SG-1 where another team travels to other worlds through the portal, but this crew is far away from home. Reality series following Funny Car champion John Force as his three daughters (ages 23, 19 and 17) all want to follow in his footsteps. The government has been moving the world’s geniuses to a small town in the Pacific Northwest. When a U.S. Marshall becomes stranded in Eureka, he finds out that innovation and chaos often collide in this secret city. Eleven singers compete to learn from music business professionals and win a major recording contract. Morgan Spurlock returns for a second season where he documents various month-long experiments. This season starts out with a member of the anti-immigration group the Minutemen lives with a family of illegal immigrants for one month. Stan Lee leads this reality series looking for someone that is willing to give up their job to become a real-life superhero 24/7. The winner will be the star of a new comic Stan Lee will create and be featured in one of Sci-Fi’s fabulous Saturday night original movies. Returning shows that I will continue watching: Hustle, Monk, Reno 911. I know Jer will be watching Stargate shows. 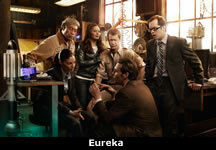 New shows that I will check out: Psych, Nightmares & Dreamscapes, and Eureka. Amy can’t stop talking about that Pysch show. 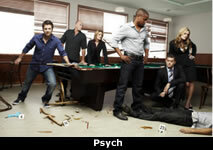 We can’t stop talking about how dumb that psych show looks in this house.